Employee safety is key for any business. With more and more businesses moving away from the traditional 9 to 5 and with many employees having the flexibility to work between the home and the office; the importance of travelling and commuting safely is always a concern. Like the much-loved Bobby backpack, the Cathy Backpack specialises in safety. If you’re not familiar with the Bobby Backpack, then it's designed to be a safe and comfortable travel companion! The Bobby is made from high-quality, cut-proof material and includes, hidden zip closures, an integrated USB charging port and reflective safety strips, enabling the user to have an easy and safe commute as possible. Keeping all the great elements of the Bobby, the Cathy Backpack has been designed to go one step further in its functionality. As well as keeping belongings safe, it's been created to help keep the user safe, with the introduction of a protection alarm. 65% of all women have had to deal with some kind of harassment, and 20% have been stalked or followed around. While the Backpack may not always be a suitable travelling companion, the Cathy Protection Alarm provides a great alternative. 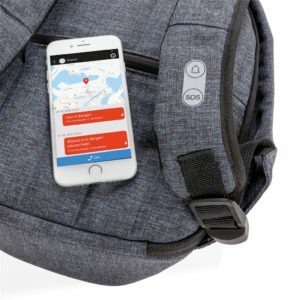 Using the same alarm functions as the backpack, the charm can be looped around a bag of choice; helping to turn fashion bags into ones that will help the user to feel protected. If you would like to discuss the products featured, or any other items to help with employee safety initiatives, call us on 01623 636602 or contact us via the website.